Recently, I decided to make vegetable broth. I already make my own chicken stock, and after purchasing yet another can of tasteless, store-bought vegetable broth over the holidays (I can’t find one that I like) I decided it was time to make my own. *Please note: Do not put anything rotten, molded, or dirty in with your scraps. Kelly’s Vegetable Wash: I use a mix of 1 part vinegar to 3 parts water and wash my vegetable before peeling with a vegetable brush. When I am making vegetable broth, I use whatever I’ve collected in my freezer bag from the vegetables we’ve been eating. I’ve noticed that the primary ingredients that are in my vegetable broth are carrots, onions, and celery. Those three components are known as a mirepoix, referred to as the “holy trinity” of flavor in Creole and Cajun cooking. But I add in whatever is in my freezer bag. This time, I had sweet potatoes, parsnips, turnips, and collard greens. Use whatever you have on hand. The flavor will vary according to what you have to use. I was amazed at how good this tasted. Vegetable broth doesn’t have to cook all day. It will just take about an hour and a half (90 minutes). I cook mine on the stove top instead of using the crock pot. After it cooks and cools down, I freeze it in ice cube trays. Eight cubes equals one cup (approximately). For those of you who would prefer to go by an exact recipe for vegetable broth, I realize this will be little challenging! But trust me, no matter what you put in your homemade vegetable broth, it will taste great. Your freezer bag full of vegetable scraps. In your largest stock pot, place your vegetable scraps from your freezer bag, coarsely chopped. Add thyme, parsley, rosemary, peppercorns, garlic, and bay leaves. Fill stock pot with distilled water up to the top, then bring it to a rolling boil. Let it simmer, covered, for about an hour. Pour vegetable broth through strainer into pitcher. Pour into ice cube trays, freeze, then place cubes into labeled freezer bags. 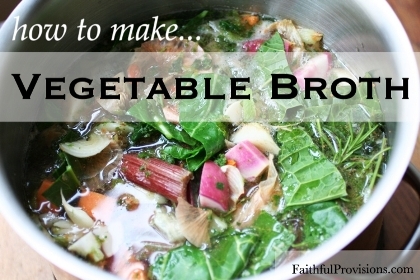 You can learn how to make my recipe for chicken broth HERE on Faithful Provisions. These homemade broths are just the ticket for winter soups and stews.